When you close down your cottage for the winter, you will need to empty the water system to avoid burst pipes and other damage that freezing water can cause. Over the years, despite my precautions, I have had to replace taps, fittings and water heater elements owing to my forgetting about some part of the process. I now use polypropylene half-inch pipe for all the plumbing, together with plastic fittings, as I find these are more forgiving if any remaining water in the system freezes. I usually empty the hot water heater first, having turned it off (the element can burn out otherwise). 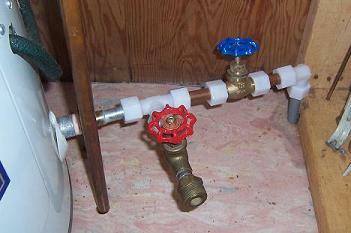 For this, I installed a tap on the line into the heater (blue in the picture) so that I am able to turn off the flow. Between this tap and the heater itself, I have a T fitting that takes a short length of pipe to another tap (red) that I use to drain the heater. At the end of the very short length of pipe out of the tap, there is a fitting to screw on a garden hose. After attaching the garden hose, and running the hose out of the house, I open the tap to the hose and let it run for a few seconds so that there will be enough water in the hose to cause a siphoning effect. I then close the blue tap on the line to the heater, and open the hot water taps in the kitchen and bathroom to allow air into the system. The water in the heater will siphon off back through its input line, and out through the T fitting to the hose. This can be left for half an hour or so while it drains. The next step is to drain the pressurized cold water tank. The water pump needs to be turned off at this stage. A garden hose is attached to the tap at the bottom of the tank (which in our case is under the cottage), and the tap is opened. The remaining pressure in the tank will force all its contents out. When the pressure falls to the point where the water is only gently flowing out of the hose, I open all the cold water taps in the kitchen and bathroom. The siphoning effect of the water in the hose will draw the water out of the rest of the system. This method will only work if the bottom end of the hose is some feet below the water tank. In our case, the land slopes down away from the house, and the drop is sufficient for this method to work. This will not be appropriate for every cottage. Some people use compressed air to clear the water lines. As I mentioned earlier, we use polypropylene pipe and fittings for our plumbing, and plastic being what it is, the pipes sag in places, retaining some water after the system has been emptied. Even when this water freezes, it does not damage the plumbing. Copper pipes are a different matter, however. The pipes have to be installed in such a way that water can flow down to the systems drain tap, leaving no places in which it can settle and freeze later. The effect of freezing on copper pipes is well known - they split easily. The U-bend traps under all the sinks, the showers and in the toilet also need to be dealt with. In some cases, I empty the trap as far as possible using a small hand pump and plastic tubing, then add plumber's antifreeze. In another case, I am able to empty the trap completely as the plug in the bottom of it can be unscrewed to let out the water. In this particular case, however, I put back the U-bend plug, leave the regular plug in the sink outlet and block the sink overflow using electrical tape to prevent smelly fumes coming up from the septic system and filling the cottage in our absence. If you plan to use the cottage during the winter, you will need to be able to use the toilet. You either have to find some way of turning on the water system so that the toilet can be flushed or bring in loads of water to pour down it. Our original solution was to use a Flush-o-matic water-saving toilet year-round. It was connected to the cottage plumbing system, and in the warmer months it could be flushed easily. In the winter, when the water system was shut down, it could be flushed manually with just a litre of water brought in from the well. This eliminated the need to turn on the water system. However, it developed a problem and I found that it was no longer possible to get parts for it. Instead, I installed a low-usage dual-flush toilet that uses a minimum of three litres of water. This is not ideal, as in winter you need to cart in substantial amounts of wateeer to flush it. Another type of RV toilet might be the eventual solution. After the rest of the system has been drained, you can remove all the metal plugs from your jet pump or piston pump to let out the water. Put them all in a plastic bag, label them, and store them in a kitchen drawer where you are sure to find them in the spring. Make sure there is a separate switch for turning the water heater on and off. If you rely only on a breaker on the service panel, it is possible to forget it on winter visits when you turn the breakers on, and you can burn out the heater element in the empty heater tank. This was learned through bitter experience. Cash Acme SharkBite brass fittings are new on the market, and can save a lot of time when doing your own plumbing with either copper or plastic pipe. They allow you to join pipes instantly using push-fit connections, doing away with soldering. The fittings can also be removed with a special plastic tool and then re-used elsewhere. Although they are a little expensive, their ease of use and re-usability is unparalleled. Here is a picture of a straight connection and the orange tool used to disconnect it. On activating the water system in the spring, replace any drain plugs in the pump (but not the priming plugs), and fill the pump and down pipe with water through the priming openings, and then replace the plugs. Make sure that all taps in your system are closed before turning on the pump, particularly the tap used to drain the water heater, as it will flood the area around the heater if you forget it. Be sure to empty the water out of any ceramic/carbon filters, as freezing may crack the ceramic exterior or contribute to breakdown of the carbon material. Other filters should also be emptied, as well as the U/V chamber in a U/V water purifier.